Dr. Richard Wags is MainStreet Family Urgent Care’s favorite canine companion and company mascot! 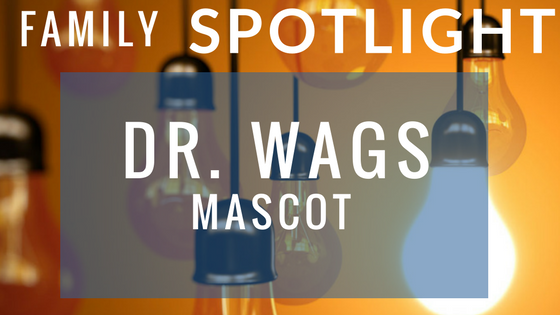 This month we are focusing our Family Spotlight on our company mascot, Dr. Wags. Born in Dogtown, Alabama, our KidsStreet Family found Dr. Wags as a young pup with a talent for making kids smile! We took him into our Family and raised him as our own. Dr. Wags completed undergraduate degrees at both The University of Alabama and Auburn University. After supporting himself to achieve his dream of being the first dog to graduate from medical school, Dr. Wags dedicated himself to helping others in smaller towns like where he came from. Dr. Wags wants to ensure no one is without convenient, friendly and fast healthcare ever again! Dr. Richard Wags loves getting involved in community events all around the Mobile County area. In the past, he loves participating in fun runs, parades, school events, and even germ presentations at our local schools, and he really loves events where he gets to dance and meet the children who live in the area. If you’d like to see what Dr. Wags is into at all of our clinics, he loves to post regularly on his Facebook page. You can follow Dr. Wags on Facebook by following this link. Next time you see Dr. Wags out and about in Oneonta, make sure you give him a big hug or a high-five! He would love to be your new friend!